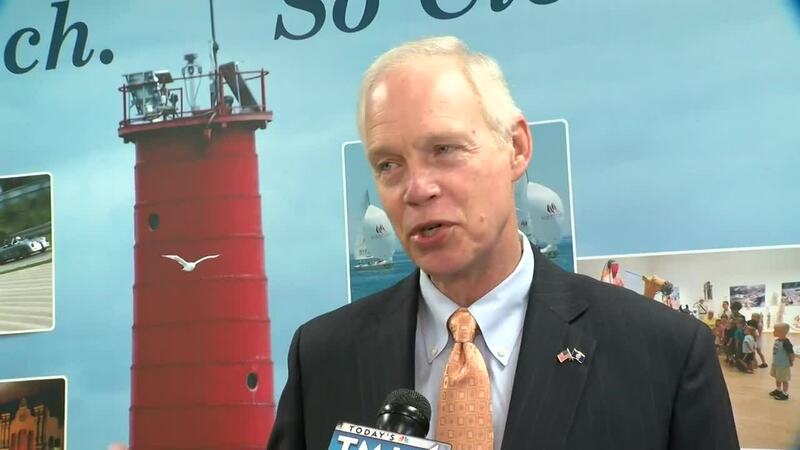 With a number of issues at the federal level for manufacturers in Wisconsin, Senator Ron Johnson tried to ease some of those fears Friday in Sheboygan. With a number of issues at the federal level for manufacturers in Wisconsin, Sen. Ron Johnson tried to ease some of those fears Friday in Sheboygan. With dozens at the Sheboygan County Chamber of Commerce, Sen. Johnson spoke about the biggest issues facing manufacturing in Wisconsin: lack of workforce, immigration and secondary education were his main focuses. "One of the things I've been doing with President Trump's administration, they're aware of the harm being done to Wisconsin manufacturers and agriculture interests, while they're trying to accomplish a goal most manufacturers and farmers agree with," Johnson said. As the United States and China near a trade agreement, Sen. Johnson says one of President Trump's economic advisors is very upbeat. He says once this deal goes through, it will benefit Wisconsin manufacturers. "In the negotiations, I've been pressing the administration pretty hard for a number of months to get the conclusion of all these trade deals so we can return the stability and certainty President Trump has brought to our economy," Johnson said. "We need to make sure China is abiding by the rules. Let's keep our fingers crossed. The sooner we can conclude these deals the better." The manufacturing business faces more issues than just trade. John Rogers of the Sheboygan County Chamber of Commerce says they struggle at filling jobs. He says there are consistently 3,000 or more job opportunities in the county they can't fill because of a lacking work force. "If our schools can't supply our manufacturers with workers, today and in the long term, we're doing a disservice to them," Rogers said. "Students and parents need to understand all options," Johnson said. "Going into the workforce, the military, technical college, community college, two year, four year, a host of options. Not everyone has to get a four year degree." Baldwin also sees the benefit of retaining talent in Wisconsin through technical college. She said in a tweet, "In Wisconsin, we have a long tradition of investing in quality education - including Career Tech Ed. I'm celebrating #CTEMonth because when we provide students with the skills they need to succeed, we can also help businesses create stronger economic growth." In #WI, we have a long tradition of investing in quality education – including #CareerTechEd.